A Beautiful Arrangement of Imported Silk/Art. 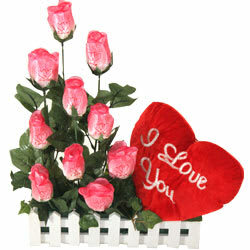 10 Pink Roses with Heart Shapes on Petals and also a Heart Shaped Cushion. The Flowers and Leaves are washable and can be enjoyed for months. Order this for a long lasting memory.